But not at all like grandma use to make. Feel free to double everything for leftovers (I always make enough for good protein snack, lunch, or another dinner ). But this does tend to get a little soggy after it’s been in the fridge. We actually put tomato sauce and shredded parmesan cheese on it today for a great lunch. Cut chicken into strips and pat dry. In a flat bowl mix together almond meal and spices. Put each stripe in the mix and be sure to cover chicken completely. I really kind of pat or rub it in the chicken. Turn the heat high and pour in about 1 tbls coconut oil and spread all over large pan. You can use olive oil but coconut oil does better with higher heat, plus it’s better for you. You can’t even really taste the coconut. Cook until brown (about 3-4 minutes), then flip. Once the other side is brown, cook on low heat for another 10 minutes. Set on plate with paper towel so it doesn’t get soggy while cooling. Let cool about 10 minutes. Preheat over 450. 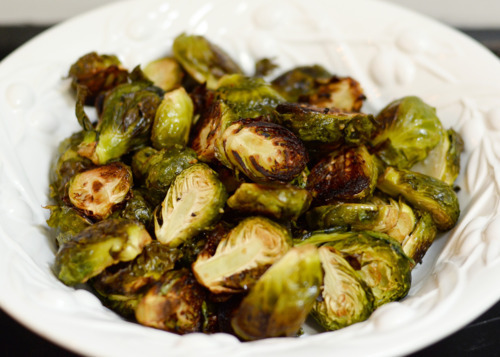 Wash and cut brussel sprouts in half lengthwise. Mix in large bowl with 3 tablespoons olive oil and salt. Pour single layer of brussel sprouts on cookie sheet. Let cook 20-25 minutes, or until brown. Stir occasionally. If you want them a little extra crispy (my kids love them crispy!) turn over off and let them sit in the over for about 10-15 extra minutes. You may want to only cook them 20 or so minutes just to be sure they dont stay in the over too long and burn (even with the oven off). Steam cauliflower until soft. I drain it in the colander and then cut it up there so it’s easy to get it all in the blender. Blend everything together until smooth, and that’s it! Easy, right? I hope you enjoy!